Thx. I agree with you on "Wichita Lineman." It's my favorite song of his. He was a year younger than Elvis. 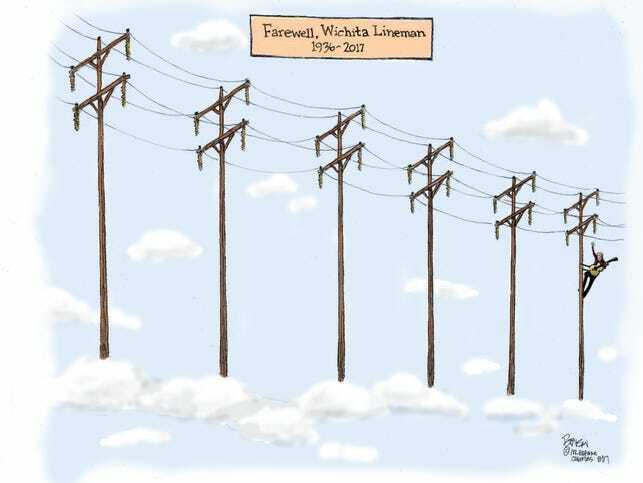 Steve--your cartoon is visually beautiful and haunting--every bit as haunting as the song, "Wichita Lineman!" I generally don't cry on hearing of a celebrity's passing; but, your drawing made me cry over Glen Campbell's death. IMO, it hands down beats "By the Time I Get to Phoenix"--even though I live in the Phx metro area and Glen lived in Phx for 20 years. Edited 5 time(s). Last edit at 08/11/2017 01:08AM by steve benson. Great song, and wonderful cartoon! His major hits were written by Jimmy Webb: "By the Time I Get to Phoenix", "Wichita Lineman", and "Galveston". That was such a great collaboration. Webb is an amazing songwriter. Another cover on Campbell's "Wichita Lineman" album is "Dock of the Bay" which my older sister must have played a million times growing up. I thought that that was the definitive version of "Dock of the Bay", so when I finally heard the Otis Redding version I thought it was okay, but not as good as the original version. My tastes have changed since then and I think I prefer the Redding version now, but, man oh man, we practically wore GC's albums out in the late 60s and early 70s. I still lean in every time I hear "Wichita Lineman" or "Phoenix". This thread sent me down a Glen Campbell rabbit hole. I always felt Galveston was a more effective protest song than the usual strident anti-war songs of the era. I loved "Wichita Lineman." Nice one, Steve. Thank you for the wonderful tribute! One of your best. Very touching. Used to love Wichita Lineman at five in the morning on my way to work at the Defense Depot in Ogden. It was haunting. I am still south of 30 so I wasn't around when it was popular, but that song, Wichita Lineman, really speaks to my soul. You don't get much of that with modern music. Edited 3 time(s). Last edit at 08/10/2017 12:00PM by cynful. Still riding. Still on the line. Perfect tribute. Surely, you haven't/won't receive any 'hate mail' over this one! May I share it? It's perfect! Nice video of Glen Campbell singing "Wichita Lineman"
Edited 2 time(s). Last edit at 08/11/2017 01:07AM by steve benson. One of your best, Steve! And with a guy battin' in your league, that's saying something. I finally watched last night on Netflix the movie "The Wrecking Crew" which talks about the "crew" of musicians who played on a majority of rock music tracks in the 60's and into the 70's. In Glen Campbell's early career, he spent lots of time playing lead guitar on many of these sessions, before he ever started making albums of his own. It was produced by Denny Tedesco, whose dad, Tommy Tedesco was a mainstay of the wrecking crew years and is kind of the focus of the movie. But he interviews lots of musicians, including Glen Campbell, about how much time the spent in these sessions. Did you know that Glen Campbell played on Frank Sinatra's "Strangers In the Night"? and for anyone in my age range, that was a huge song for Frank, after a few years of kind of being off the charts. That could not have been more beautiful! Thanks! Gentle On My Mind is the best of the best imo, penned by the late great Mr Johnnie Hartford. I developed a long crush John Hartford when he and Glen sang "Gentle on My Mind" on the Smothers Brothers Comedy Hour. According to the you tube clip it was March of 1968. I have a vivid memory of sprawling on the living room floor, listening to my parents disagree with the brothers' political views. When that song started everyone stopped what they were doing and sat there silently transfixed. The song hadn't yet received wide airplay where we lived but it later became the rare song of that era that parents and kids all loved. That appearance on the Smothers Brothers had a semi-transparent arty movie images running intermittently over the musician shots, which was a big deal and caused a lot of comment at the time. A precursor to music videos, I suppose. I knew we'd lost John Hartford but your post prompted me to check what he'd done in his later years. What a renaissance man! Incredible musician and also a river pilot. It was so touching to read that they named a river navigation point after him. One of my favorite Glen Campbell songs is an instrumental... Campbell plays bagpipes on it. It's called "Grafhaidh Me Thu". He also recorded a version with words called "I'm Gonna Love You". I couldn't hear what I was playing even even after turning my amp up to 11. Playing them is an impressive feat, nevertheless. Edited 1 time(s). Last edit at 08/13/2017 01:42PM by Soft Machine. We had a piper at our wedding. He played for us in his office at VMI before we hired him... practically blew us out of the room. Edited 1 time(s). Last edit at 08/13/2017 09:42PM by steve benson. Thank you Steve for this beautiful tribute. I think you nailed it. I just printed it to frame and hang with a picture I took of Glen when I saw him in concert in '79. Edited 1 time(s). Last edit at 08/12/2017 01:04AM by steve benson. not only about the cartoon but, most of all, about Glen Campbell. Edited 1 time(s). Last edit at 08/12/2017 01:13AM by steve benson. not just of Glen Campbell's, of all songs. One of the few Steve Benson cartoons I like. Thank you, Steve! I love Glen Campbell and his music. I'm happy he's no longer in pain, but saddened he's left us. RIP and Godspeed, Glen! I don't give a damn about many of my cartoons you don't like. This is about Glen Campbell, not you. Yeah, the Smothers certainly had a plethora of talent.....Mason Williams comes to mind. Thank you Steve for a lovely tribute to Glen Campbell. His music was a pleasant part of my childhood, his melodies often replaying themselves in my mind after I heard them on the radio. Your drawing will remain for me a fitting memorial at his passing. It reminds me of the tribute you drew for Jim Henson, as he walked into the sunset, his characters waving farewell. That one remains etched in my memory from years ago recalling the delight he gave me as a child. Glen Campbell and his Jim Henson back-up singers . . .
Edited 4 time(s). Last edit at 08/14/2017 03:30AM by steve benson. Glen Campbell and Ezra Taft Benson in a related link . . ,.